This Thursday evening Aid to the Church in Need has arranged a prayer vigil 7.00-8.30 pm, here at Christ the King. An opportunity to learn about, reflect on and pray for all Christians around the world who have been forced to flee their home, family and friends. Please come along. 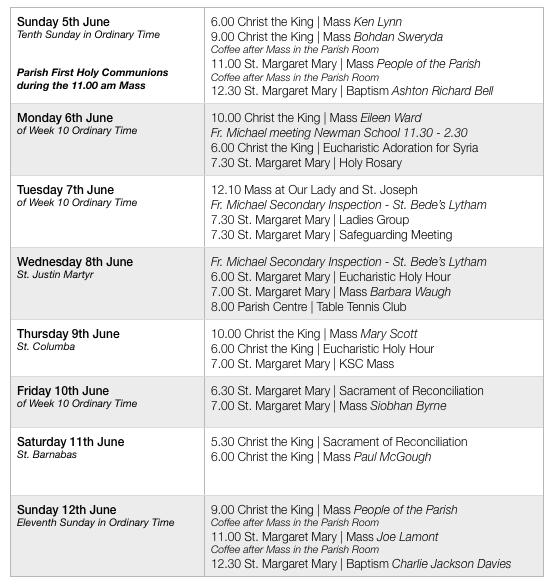 There will be no Eucharistic Holy Hour that evening. 72 + 79 + 75 = 226 were at Mass last weekend. Thank you for your offering of £406.20 + £201.57 = £585.78. An opportunity for daily prayer and liturgy with a Community. Time to think about your faith. To be part of a small, friendly group. To share home-made meals. Freedom to explore the Cumbrian countryside. See the poster. To book a place, please contact Sr Margaret Atkins, on 015395-32288 or visit www.boarbankhall.org.uk.The cost of the week, including full board, is £350-£380 for a single room, £300 for a shared room or £225 for students, the low paid and the unwaged. Thank you to all involved in organising this event in the parish and for all who came along to support what was a very successful evening. A total of £750 was raised for parish funds. 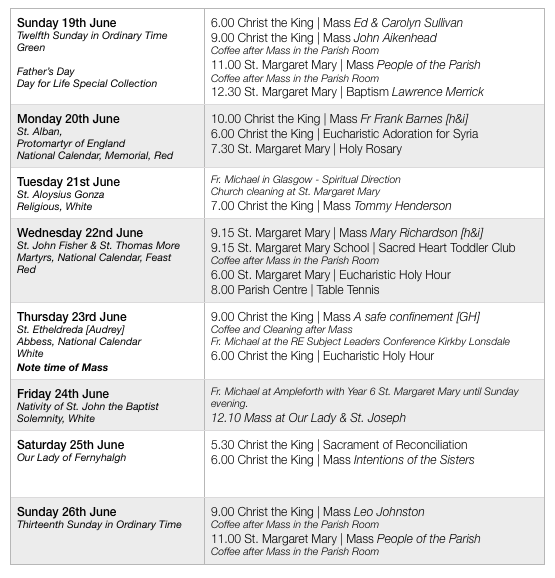 This Holy Day of Obligation will fall on Wednesday 29th June. There will be a Vigil Mass at Christ the King on Tuesday 28th June at 7.00 pm and Mass at St. Margaret Mary on Wednesday 29th at 9.15 am. Newman School will celebrate their Mass at Christ the King on the Wednesday morning. The County of Cumberland & Westmorland, The Royal British Legion, will be commemorating the Battle of the Somme 1916 event with a Vigil of Thanksgiving, Reflection and Remembrance in Rickerby Park, at the Park War Memorial, on Thursday 30th June at 9.00 pm, commencing at 9.15 pm and will conclude at approx 10.00 pm. The event, being organised by the Royal British Legion, will include community singing led by members of the Carlisle Veteran Male Voice Choir, appropriate songs sung by local folk group “Thrice Brewed”, a Service of Remembrance and the laying of remembrance candles or nightlights at the Memorial. A Piper playing a lament will mark the end of the Vigil as he leaves the scene as if heading into the Battle. It is important that we remember the Battle of the Somme, as this Battle probably caused the greatest loss of Cumbrian Military lives in any campaign in our history; the Border Regiment was in the thick of the battle and so many local people lost family members between July and November 1916. Aid to the Church in Need has arranged a prayer vigil on Thursday 7 July, 7.00-8.30 pm, here at Christ the King. An opportunity to learn about, reflect on and pray for all Christians around the world who have been forced to flee their home, family, and friends. Please come along. 69 + 87 + 97 = 253 were at Mass last weekend. Thank you for your offering of £384.21 + £201.57 = £585.78. If you would like to share any of your photographs of our recent Pilgrimage, please email greg.smith3@btinternet.com for an invitation to join a Flickr group. Year 6 from our parish primary school will be resident at Ampleforth this weekend. Fr Michael will be accompanying them. Masses this weekend will be supplied by Fr. Norman. This small action group requires men’s clothing in medium and small sizes, sleeping bags, blankets and tents, in clearly labelled bags, for refugees. These can be taken to the Op Shop charity shops at Harraby, Morton and Botchergate. For further information, please contact Rosemary Galloway-Smith on 521497. Many thanks for any help you can provide. A Summer Fayre is being organised at Our Lady & St Joseph’s church, Sunday 3 July, after the 10.00 am Mass. All are welcome. See the poster for details. Will take place at St. Margaret Mary after Mass this Sunday. Thank you to all involved in organising this event in the parish and for all who came along to support what was a very successful evening. Thank you for your response to the recent visitation of the parish by Bishop Campbell. The County of Cumberland & Westmorland, The Royal British Legion, will be commemorating the Battle of the Somme 1916 event with a Vigil of Thanksgiving, Reflection and Remembrance in Rickerby Park, at the Park War Memorial, on Thursday 30th June at 9.00 pm, commencing at 9.15 pm and concluding at approx 10.00 pm. The event being organised by the Royal British Legion will include community singing, led by members of the Carlisle Veteran Male Voice Choir, appropriate songs sung by local folk group “Thrice Brewed”, a Service of Remembrance and the laying of remembrance candles or nightlights at the Memorial. A Piper playing a lament will mark the end of the Vigil as he leaves the scene as if heading into the Battle. It is important that we remember the Battle of the Somme as this Battle probably caused the greatest loss of Cumbrian Military lives in any campaign in our history; the Border Regiment was in the thick of the battle and so many local people lost family members between July and November 1916. Aid to the Church in Need has arranged a prayer vigil, Thursday 7 July, 7.00-8.30 pm at Christ the King. An opportunity to learn about, reflect on and pray for all Christians around the world who have been forced to flee their home, family and friends. Please come along. 65 + 85 + 148 = 298 were at Mass last weekend. Thank you for your offering of £487.90 + £295.55 = £783.45. with Cor et Lumen Christi Community & guest speakers Tim & Sue Eldridge. Experience the Loving Touch of the Holy Spirit 25th-26th June 2016 Cor et Lumen Christi, Wigton, CA7 9HU. To book or for more information: Web: www.coretlumenchristi.org Email: stcuthberts@coretlumenchristi.org Tel: 016973 45623 / 07516 075896. Year 6 from our parish primary school will be resident at Ampleforth next weekend. Fr Michael will be accompanying them. Masses next weekend will be supplied by Fr. Norman. This small action group require men’s clothing in medium and small sizes, sleeping bags, blankets and tents, in clearly labelled bags for refugees. These can be taken to the Op Shop charity shops at Harraby, Morton, and Botchergate. For further information, please contact Rosemary Galloway-Smith on 521497. Many thanks for any help you can provide. Will take place at St. Margaret Mary after Mass on Sunday 3rd July. Donations of cakes on that day would be greatly appreciated. Many thanks to all who made the celebration of First Holy Communion such a success - especially to Ann, Catherine, Eileen and Eileen who prepared the children so well. The Diocese are renewing the registration of all parish volunteers across the diocese over the coming months. For those involved in taking Holy Communion to the sick, in children’s liturgy of the Word and adults who work with altar servers at St. Margaret Mary, please make themselves available on 17th June at 7.30 pm at St. Margaret Mary’s Church for the renewing of their DIB. See James for more details or if you can’t attend on either of those evenings. Parishioners are invited to a Catholic Camping Festival between 1st-3rd July at High Wray Bank on the shores of Lake Windermere. £20 a pitch camping, vans and caravans. For more info contact Paul on 07788818535 or visit www.ksccampingfestival.co.uk. Book early to avoid disappointment. Thank you for your response to the Fashion Show taking place this Wednesday - this event is now SOLD OUT with 160+ tickets sold. Bishop Michael Campbell is with us this weekend for our Visitation of the Parish. He is eager to meet parishioners - there will a shared lunch on Sunday 12th June in the Parish Centre from 12.00 noon. He will meet with the Parish Pastoral Council on Saturday evening. Please come along! We hope to deliver parcels to local families during week beginning Monday 18th July. Please check best before dates on goods. Thank you in advance for your continued generosity. St. Margaret Mary Catholic Primary School and St. Cuthbert’s Catholic Community School are planned to become a federation in September of this year. The two schools will continue as separate schools but will share a head teacher and governing body. As a result of this, the governing body of St. Margaret Mary Catholic Primary School will cease in September. In gratitude for the many parishioners who have served the parish in this important role for many many years, a Mass of thanksgiving will be celebrated on Tuesday evening at 7.00 pm. All parishioners are welcome to come along. Nationally, there are plans to hold vigils to commemorate the centenary of the start of the Battle of the Somme, Thursday 30 June. There’s a proposal to hold a Vigil Service at the Rickerby Memorial. Sunset that evening is at 9.41 pm; and so an assembly from 9.15 pm for a 9.30 pm start. If you’d like to take part as a musician, singer, reader, etc, please contact Tony Parrini: tony.parrini@btconnect.com, 674553 or 07809-154999. Carmelite priest, Fr John McGowan, of the Tabor community, Preston, will lead Women together in the Diocese, in the theme of Mercy in the Year of Mercy. Saturday 18 June, 10.00 am-3.30 pm, St Joseph’s church, Ansdell FY8 0EP. Inspirational input, Adoration, Praise & Worship, Prayer Ministry on Wednesday 15 June at Cor et Lumen Christi, Wigton, CA7 9HU. 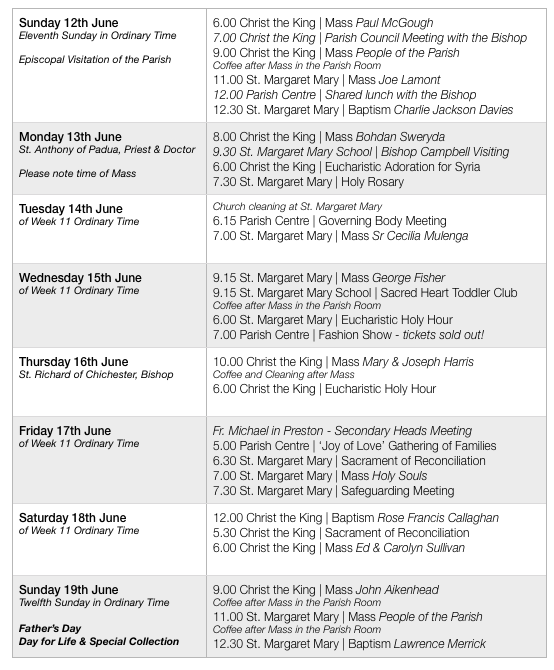 Mass at 7.00 pm, meeting starts 8.00 pm. All Welcome! Web: www.coretlumenchristi.org Email: stcuthberts@coretlumenchristi.org Tel: 016973 45623 / 07516 075896. Bishop Campbell has written to express his gratitude to parishioners for the welcome and hospitality he received at our parish titular feast - he described the liturgy and the meal afterwards as ‘exquisite’. We also featured on the ‘Bishop’s Blog’ on the diocesan website! Will be celebrated in the parish during the 11.00 am Mass at St. Margaret Mary this weekend. Please pray for all the children involved and grateful thanks to all who helped prepare the children to receive our Lord in Holy Communion for the first time. The Diocese are renewing the registration of all parish volunteers across the diocese over the coming months. For those involved in taking Holy Communion to the sick, in children’s liturgy of the Word and adults who work with altar servers at St. Margaret Mary, please make themselves available on either the 7th or 17th June at 7.30 pm at St. Margaret Mary’s Church for the renewing of their DIB. See James for more details or if you can’t attend on either of those evenings. Parishioners are invited to a Catholic Camping Festival between 1st-3rd July at High Wray Bank on the shores of Lake Windermere. £20 a pitch camping, vans and caravans. For more info, contact Paul on 07788818535 or visit www.ksccampingfestival.co.uk. Book early to avoid disappointment. Bishop Michael Campbell will be in the parish next weekend 11th - 13th June for the Episcopal Visitation of the Parish. He is eager to meet parishioners. There will a shared lunch on Sunday 12th June in the Parish Centre from 12.00 noon. He will meet with the Parish Pastoral Council at 7.15 pm on Saturday evening. Please come along to this to show the vitality and diversity within our parish. A holiday and study week, 25 June-2 July, Boarbank Hall. 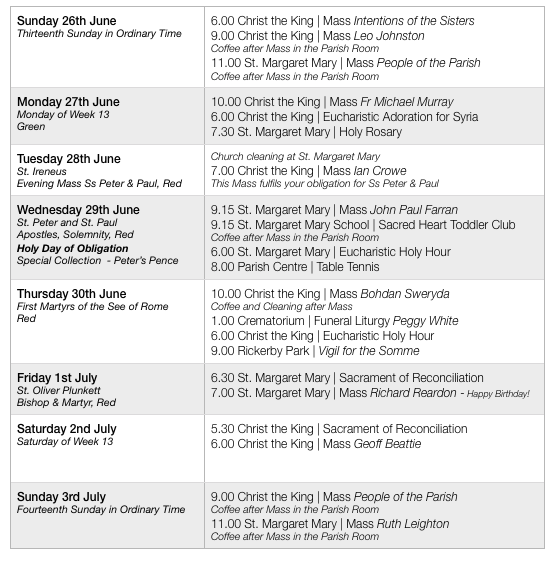 A chance to study St John’s Gospel as literature, as history, as theology……. through lectures, reading, and discussion. An opportunity for daily prayer and liturgy with a Community. Time to think about your faith. To be part of a small, friendly, group. To share home-made meals. Freedom to explore the Cumbrian countryside. See the flyers. To book a place, contact: Sr Margaret Atkins on 015395-32288 margaret@boarbankhall.org.uk or visit www.boarbankhall.org.uk. Is God calling you to be a priest? For men aged 20+ between 10th and 12th June in Hawkshead. To book a place or for more information, contact Fr. Darren on 01772 719604. 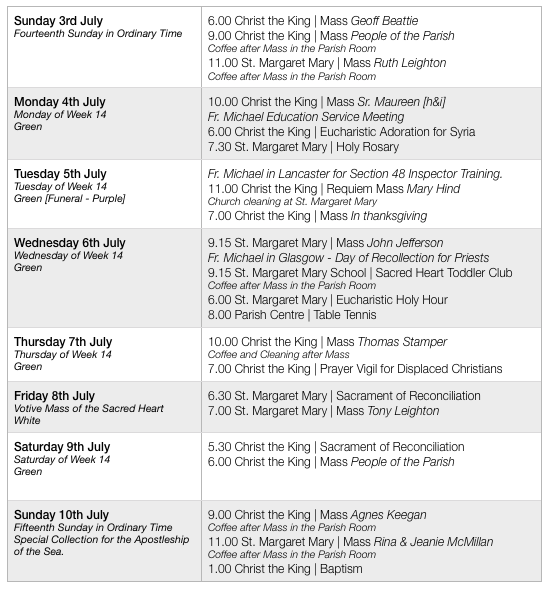 All are welcome to take part in the various events happening during the week of Parish Mission at OL&SJ, 10-16 July: daily spiritual conference after the 12.10 pm Mass; Sermon & Benediction 7.00 pm; opportunities for Confession. Meet at St. Margaret Mary on Tuesday evening at 7.30 pm. All are welcome to come along. Nationally, there are plans to hold vigils to commemorate the centenary of the start of the Battle of the Somme, Thursday 30 June. There’s a proposal to hold a Vigil Service at the Rickerby Memorial. Sunset that evening is at 9.41 pm; and so an assembly from 9.15 pm for a 9.30 pm start. If you’d like to take part as a musician, singer, reader, etc, please contact Tony Parrini: tony.parrini@btconnect.com or call 674553 / 07809-154999. Our annual diocesan pilgrimage to the medieval shrine at Ladyewell, near Preston, takes place on Saturday 2 July.